Numerous studies show that the elderly have increased oxidative stress and impaired antioxidant defense systems. As a result, the aging process in general increases with aging as a result of this double whammy. And, in addition to the aging faster, the combination of increased oxidative stress and impaired defenses also increases inflammation and the progression of many other disease processes. The focus of interventions trying to address this basic consequence of aging has focused on dietary and supplement measures to increase antioxidant intake. Not to diminish this approach, but a new study shows a powerful new way to improve antioxidant status as we age – physical exercise. 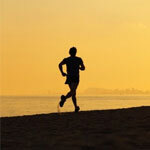 Regular physical exercise is obviously a vital key to good health. While the immediate effect of exercise is stress on the body, with regular exercise the body adapts – it becomes stronger, functions more efficiently, and has greater endurance. The entire body benefits from regular exercise largely as a result of improved cardiovascular and respiratory function. Simply stated, exercise enhances the transport of oxygen and nutrients into cells. At the same time, exercise enhances the transport of carbon dioxide and waste products from the tissues of the body to the blood stream and ultimately to eliminative organs. As a result, regular exercise increases stamina and energy levels. Regular exercise also exerts a powerfully positive effect on mood. Tensions, depressions, feelings of inadequacy, and worries diminish greatly with regular exercise. Exercise alone has been demonstrated to have a tremendous impact on improving mood and the ability to handle stressful life situations. Researchers have estimated that for every hour of exercise, there is a two hour increase in longevity. That is quite a return on an investment. Some of the benefits of exercise, especially in the elderly, may be the result of improved manufacture of coenzyme Q10 (CoQ10), also known as ubiquinone, an essential component of the mitochondria – the energy producing unit of the cells of our body. CoQ10 is involved in the manufacture of ATP, the energy currency of all body processes. Its role in the energy production within our cells is similar to the role of a spark plug in a car engine. Just as the engine cannot function without that initial spark, our cells simply cannot function without CoQ10. Although CoQ10 can be synthesized within the body, deficiencies do exist as a result of impaired CoQ10 synthesis or increased tissue needs. Examples of diseases that require increased tissue levels of CoQ10 are primarily those that affect the heart, liver, brain, and muscles. In addition, the elderly in general may have increased CoQ10 requirements as CoQ10 levels are known to decline with advancing age. Finally, cholesterol-lowering drugs, especially statins, are known to lower CoQ10 levels. In a study designed to examine the blood levels of CoQ10 in both younger and older adults an interesting finding occurred. In young people, higher physical activity correlated with lower Q10 levels in plasma whereas in older adults physical activity was directly related to the levels of Q10 in plasma. In other words, higher physical activity in elderly subjects was associated with higher blood CoQ10 levels. Furthermore, the higher CoQ10 levels in physically active elderly were associated with significantly improved measures of oxidative damage (e.g., lower levels of lipid peroxides and oxidized LDL cholesterol). These results indicate that physical exercise in elderly subjects is associated with increased natural manufacture of CoQ10 and all of the benefits that this important compound is able to exert. In particular, the practice of physical activity at old age can improve antioxidant capacity in plasma and help to slow down the aging process and prevent chronic degenerative diseases via increased production of CoQ10. One of the questions that this study asks is “Why are lower CoQ10 levels associated with increased physical fitness in younger adults?” The answer to this question is that there is also a strong relationship between LDL cholesterol levels and CoQ10 levels. Higher LDL levels are associated with higher blood levels of CoQ10. The reason for this association is the LDL is also the primary carrier of CoQ10 in the blood. Lower physical fitness in younger adults is associated with higher LDL levels and as a consequence higher CoQ10 levels. The higher CoQ10 levels in LDL simply reflect the body’s attempt to reduce the oxidative damage to LDL cholesterol. With aging, there is less CoQ10 being produced and as a result less protection being offered LDL cholesterol. Regular physical exercise increases the production of the CoQ10 levels in the cells and that results in the natural attempt by the body to utilize CoQ10 to protect LDL against oxidative damage. The results noted in the study show this attempt is very successful. Del Pozo-Cruz J1, Rodríguez-Bies E, Ballesteros-Simarro M, et al. Physical activity affects plasma coenzyme Q10 levels differently in young and old humans. Biogerontology. 2014 Apr;15(2):199-211.